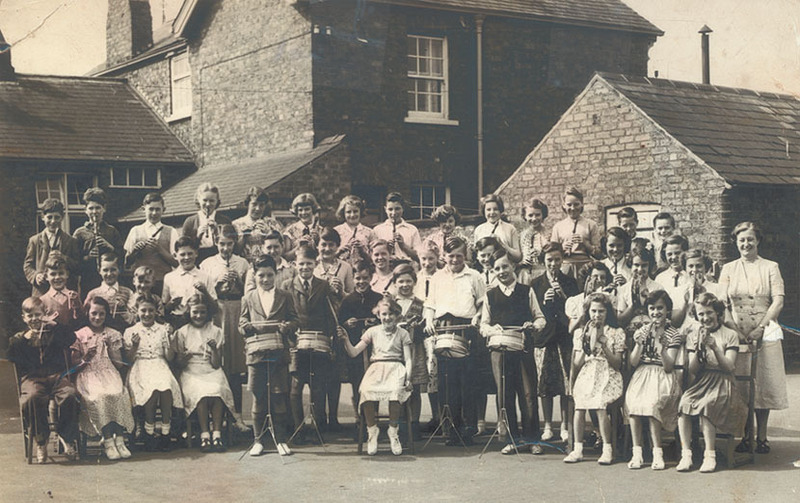 Back row: John Brown, Roy Chapman, Terry Thirkill, Eunice Flint, Pat Lilley, Alwyn Wraith, June Gilbert, Robert Jackson, Dawn Dove, Pat Crewe, Audrey Binnington, Josie Lowther, Malcolm Hoggard, Michael Gaskin. Middle row: Alan Taverner, Graham Wilson, George Gilbert, Colin Myers, Enid Hoggard, Tony Kay, Rosemary Bradshaw, Doreen Wilson, Christine Hargroves, Joyce Harper, Denise Young, Joan Kirk, Barbara Robinson, Mrs Hall. Drums: Barry Malcolmson, Richard Leadill, Brian Kirk, Malcolm Laverack, David Watkinson, Leslie Binnington. Tambourines (on the right): Back - Jennifer Nurse, Tina Carter, Anne Lilley. Front - Karen Greenwood, Mary Holmes, Anne Jackson.